:D Hope u like it. <3 Hope you like it. Aww. 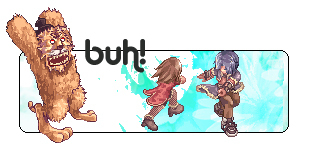 eine der ersten die ich gemacht hab xD..
is zwar kein Sprite edit oda so aba nyoar .-. My Best friend..Really loves Lunatics xD She calls her self always like that. TeqLuna. LunateQ , etc.. I edited a GM Sprite with my Favourite Hairs, headgears, etc. I made an Avatar out of it. It's not really great, 'cause it's only recolor.